Edyth, I'm off to the doll show today...now you've got me thinking of buying instead of selling! :~) This was a great lesson. Edyth, I have questions, questions, questions. Can you recommend a source for body patterns? I need one for enormous china heads...9 inches and up. What have you used for stuffing? I don't like the light feel of dolls stuffed with batting. 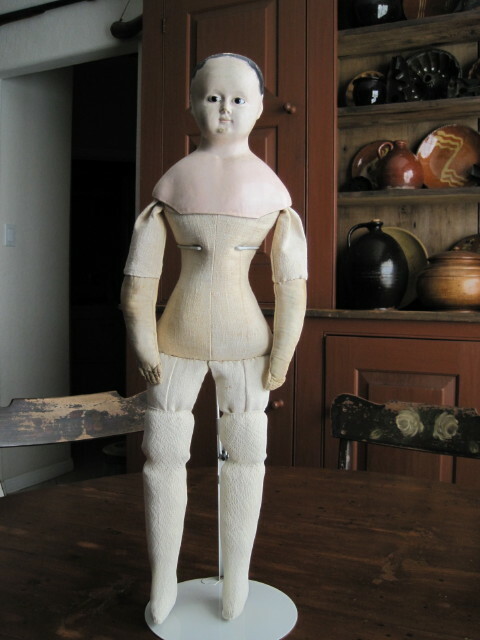 Have you ever made leather arms for a doll? I love the look of them. Can you recommend techniques and tools for making them? I have lots of heads in need of bodies. Begin with a good pattern and size it up in increments to give you a range of sizes. I often sew several torsos to get one just right and keep the extras to use another time. 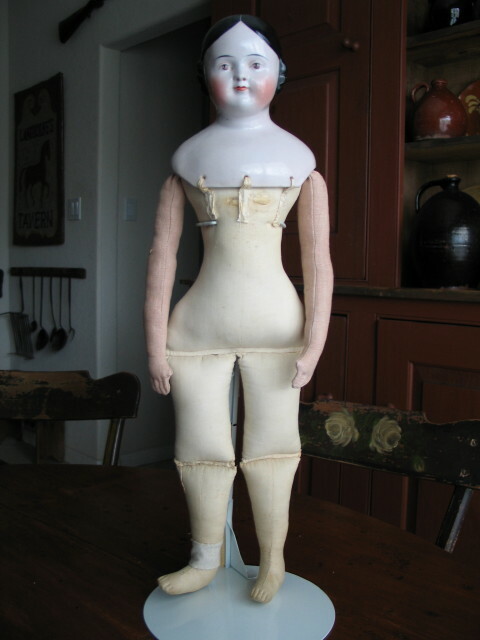 Several great body patterns are in the old book "Dolls A new Guide for Collectors" by Claire Fawcett. There are patterns for leather hands there. Easy to find book on ABE. Others might be found on line, search there. For stuffing I do use cotton or poly, and I add a significant rock in the bottom half of the torso. China Heads are heavy! Wadded up cloth stuffed in carefully is traditional. I do not ever use sawdust, it will rot the doll. Just begin on a small to medium one and learn as you go. I was just think about what are the rules for body proportions. This was very helpful.Thank you. If you are looking for actual body patterns and helpful construction information, copies of patterns created by Geri Milano are available for a very fair price. There are patterns for bodies starting at 4" tall and it goes straight up from there. The seller also features a number of male and female clothing patterns for old china dolls. Enjoy!